This once-endangered water bird is now the comeback kid. Around the world, people have associated the pelican with themes of self-sacrifice and rebirth. In Indian folklore, a pelican killed its young, but out of contrition resurrected it. In medieval times, pelicans represented the passion and self-sacrifice of Christ, perhaps because they press their long bill onto their chest when feeding their young, so it appears they are stabbing themselves. The brown pelican, the smallest of the world’s seven pelican species, made its own triumphant resurrection from near-extinction, thanks to the hard work of many people and groups, including the Texas Parks and Wildlife Department. Late last year, the U.S. Fish and Wildlife Service (USFWS) announced that the brown pelican has recovered from its status as a federally endangered species. A trip to the coast seems incomplete without these large, fish-eating seabirds, soaring high or dive-bombing the sea to catch fish using their keen eyesight. But for many decades, they declined to the point where they nearly disappeared from the world’s collective ark of species. Before pelicans received protection from the Migratory Bird Treaty Act of 1918 and later the Endangered Species Act, fishermen killed them, concerned about the birds’ appetite for fish. Scientific studies later showed that the birds had no significant effect on fishing catches. During the early 1900s, hunters killed brown pelicans to sell their feathers for women’s elaborately plumed hats. 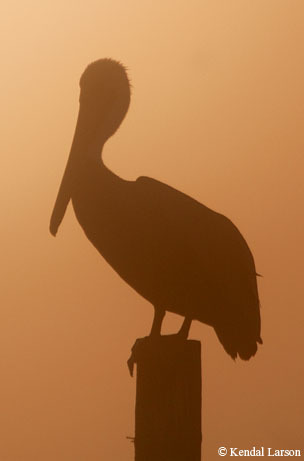 We can thank pelicans for the creation of the National Wildlife Refuge System. German immigrant Paul Kroegel, who arrived in Florida in 1881, tried to stop the slaughter of pelicans at nearby Pelican Island by standing guard with a gun. Kroegel and influential friends helped persuade President Theodore Roosevelt to create Florida’s Pelican Island National Wildlife Refuge in 1903, America’s first. But the pelicans weren’t out of the woods. The pelican’s true nemesis came later in the 20th century when the chemical pesticide DDT caused the birds’ eggshells to thin. Few hatched. The population plummeted, down to only 50 birds in Texas. Pelicans were declared endangered in 1970, and DDT was outlawed in 1972. The Endangered Species Act mandated efforts to save the species and provided impetus to preserve and create nesting habitat. The birds have made a fantastic recovery throughout coastal America and in the Caribbean, though it has occurred piecemeal. The USFWS delisted the Atlantic Coast and Florida and Alabama populations in 1985, but before USFWS could fully delist the brown pelican, the Gulf Coast and Pacific Coast populations still had to recover. Biologists relocated pelicans from Florida to Louisiana over a 13-year period, and one project in Texas played a crucial role in recovering pelicans along the Gulf Coast. “The Houston Audubon Society approached TPWD and brought up the issue of ongoing erosion on North Deer Island [in Galveston Bay], which Audubon had measured at 20 feet per year,” says Jamie Schubert, the TPWD biologist who led the multiorganizational effort. 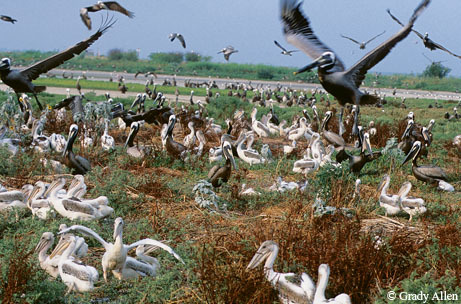 Over the past 15 years, efforts have restored salt marsh, stopped erosion and turned the 144-acre island into the largest pelican rookery on the upper Texas coast, and in some years the entire Texas coast. “The project is not directly responsible for the increase in the pelican population, but the project is important for maintaining the habitat over the long term and keeping them delisted,” Schubert says. TPWD was awarded the Coastal America Partnership Award from the federal government in December 2009 for its work on North Deer Island (see “Baby Bird Island” in our April 2007 issue). The USFWS declared the formerly endangered brown pelican fully recovered with a global population of 650,000 individuals, though the majority of those live in South America. The Gulf Coast has 12,000 breeding pairs, and to make sure the pelican population stays healthy, the USFWS has a Post-Delisting Monitoring Plan.